Appearance: Typical kukri shape – not long, but thick snakes with a short tail and no real separation between neck and head. Very small head. Pattern on top of head indicative of most kukri species. Venter is creme or pink. Range: All over Thailand. 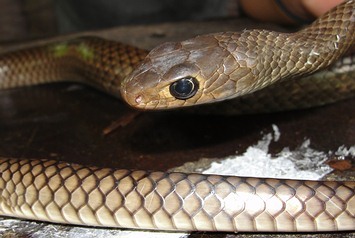 Brown Kukri snakes were once thought to be native to only the southernmost Thailand provinces, however J. Bulian has found one in Pattaya and there have been others discovered farther in the northeast. Assume the Brown Kukri’s habitat is across most of Thailand. 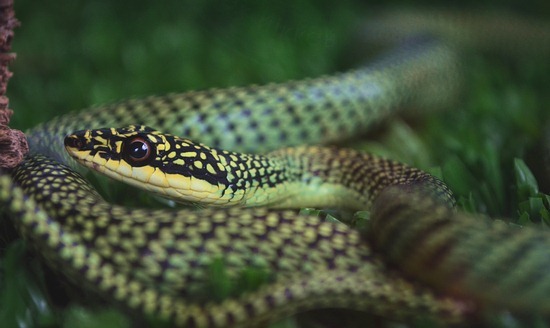 Habitat: These snakes prefer life in the forest and can be found at great elevations – about 1 mile high (1,600 meters). I have received numerous requests to identify this snake from readers who found them close to or inside their homes as well. The habitat is wide and varied for this species. Regardless where they are found, they enjoy living under brush, wood, rocks, and thick flora. Active Time? Nocturnal, active at night and in the early morning as the sun rises. I have also found them in the middle of the day, and toward evening before sunset. Food: Frogs, lizards, geckos, skinks, and their eggs. Defensive Behavior: If the brown kukris are bothered enough they will roll their body to the side and lift up their tail – perhaps to present it as a place to attack – leaving the mouth free to strike when the aggressor does go for the tail. Kukri snakes have specialized egg-slicing teeth in the back of the jaw which are enlarged and shaped like a kukri knife. When held by the head, this snake can expertly twist the jaw around to stick the handler with these teeth. Holding is not recommended. Offspring: Lay 6-12 eggs. A reader reported his snake had 8 eggs the first time and 10 the next. Eggs hatched after 60 days, incubated at 29 degrees C. Hatching in Bangkok latitude around late April. You’ll need a tetatus shot if you are bitten, as with all snakes as a precaution. Kukris are common and you might see one in Thailand if you live here. Classified by Schlegel in 1837. Oligodon purpurascens, a very common kukri snake in our area. These have a fairly wide range in the south of Thailand. Brown or Purple kukri snake. Extra beautiful after hatching – the Indo-Chinese rat snake juvenile doesn’t resemble most of the adults which turn dark brown, grey, or black as they mature. Length: Adults are just over 1 meter, but can reach near 2 meters. Range: All over Thailand and most of Asia including: Burma (Myanmar), Cambodia, China, Hong Kong, India, Bangladesh, Indonesia, Laos, Taiwan, Thailand, Vietnam, Western Malaysia, and Singapore. Habitat: Anywhere rats and lizards exist in abundance. They aren’t found on hills or in mountains, usually just the low-lying areas and where people and garbage are. Active Time? Diurnal – active during daylight hours. Food: Rats and other rodents, frogs and lizards. Much prefer rats. These are primarily rodent eaters and they vary little from their diet because there are usually plenty of rats or other rodents available. Defensive Behavior: Will flee very quickly if given the chance. 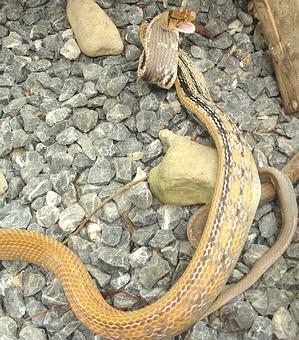 If agitated, rat snakes bite quickly. Some of them will calm down enough that they can be free-handled without repetitive bites. Venom Toxicity: No venom that is harmful to humans. Offspring: Eggs which hatch in early to middle May in Krabi, Thailand. Notes: These are very common snakes, and are seen a lot because they prefer to be active during the daylight hours. They have very large eyes, which would make one think they can see well at night as well. These snakes can be held without striking (see video below). Ptyas korros can be silver, grey, or brown – orange looking in color. Scales on the posterior part of the body and on the tail often yellow and edged with black. Underbelly is light yellow. Juvenile Indochinese rat snakes have a transverse series of round whitish spots or narrow yellow transverse bars. Indochinese rat snakes eat predominantly rats and other rodents. 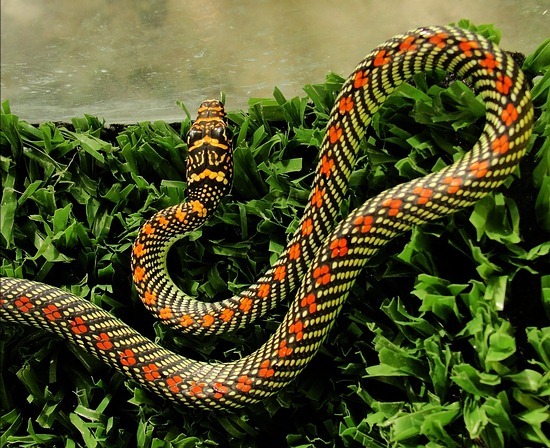 Indochinese rat snakes are silver, black, grey, brown, or orange in color. Did you get our FREE PDF file yet? 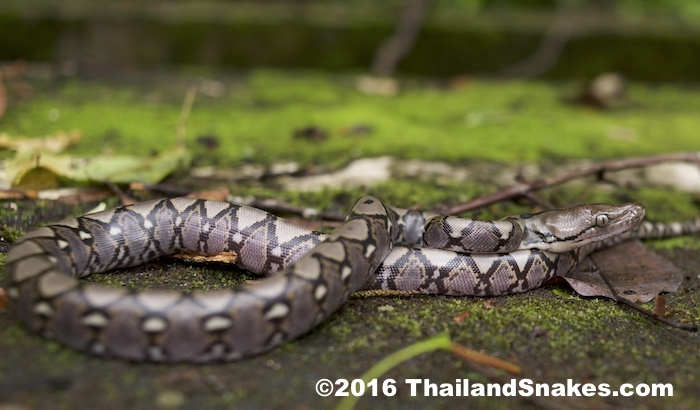 PHOTOS OF COMMON THAILAND SNAKES! many snakes featured: Cobras, Kraits, Pit Vipers, Corals, Rat Snakes, etc. 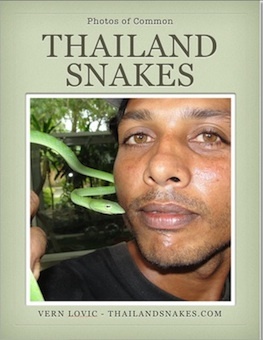 Thailand has around 185 snake species considered non-venomous, or mildly venomous and not a threat to human beings. Though these snakes are not known to be dangerous to humans, that doesn’t mean that they are not. 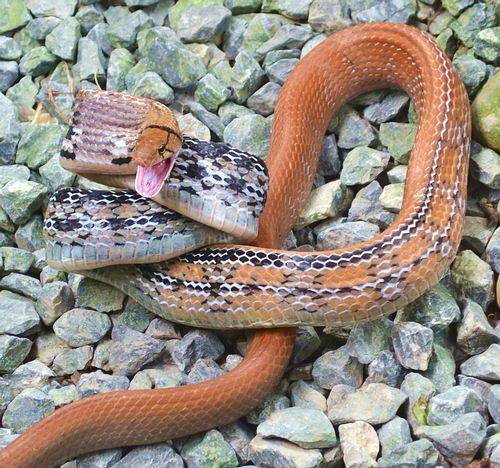 The red-necked keelback, for instance, was a snake kept in aquariums across the world for years before the first deadly bites occurred. Turns out that they have a very strong venom that can be delivered with prolonged or multiple bites. Do be careful with all snakes. These snakes are very common and it is probably the most commonly seen snake among tourists and Thai locals. They are at home in the bushes and on the ground during the day. They are excellent climbers and prefer to eat the tokay geckos and other geckos. These snakes have a mild venom that can kill or disable birds and other small animals. It is not likely to affect your dog or cat, if bitten. Golden Tree Snake – aka Flying Snake. Not dangerous. Quite fast in trees. A close relative of the golden tree snake, this is the ‘paradise tree snake’ – Chrysopelea paradisi. Very similar in appearance with the addition of some orange or red color to some of the scales on the top of the body and head. 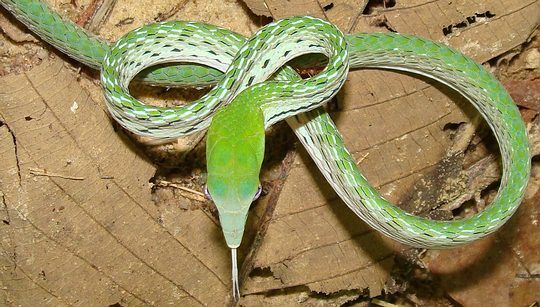 The oriental whip snake is a really gorgeous snake with a very thin body – up to two meters in length. The color is usually bright green, but there are some which are grey, brown, or even yellow. This snake is harmless for people, but has a mild venom which affects lizards and birds they prey on. Easily recognized by it’s very long head in the shape of an arrow, and another feature, harder to see – the tongue stays out when annoyed. This rat snake is also very common no matter what type of weather or season. These are terrestrial (land-based) snakes with excellent climbing skills. They hunt lizards and other small animals on the ground during daylight hours. Rat snakes have no fangs, but their saliva is known to contain venom proteins. Nobody has been recorded in the literature as having been envenomated significantly by these snakes. Color varies from brown to grey or black. Coelognathus radiata. Copper-headed Racer / Radiated Rat Snake. These rat snakes are common around trash bins, and anywhere rats and other rodents can be found. Though they are primarily terrestrial, I have seen one 3-4 meters up a palm tree raiding a bird nest of its young or eggs. These are strong, very fast striking snakes with a lot of nervous energy. Like the other rat snakes, it has no fangs with which to deliver venom. While usually the radiated rat snake has more of a yellow tone to it, this one was quite orange / brown. They have an amazing pattern when defensive and flared up. Oligodon purpurascens, a very common kukri snake in our area. These have a fairly wide range in the south of Thailand. Kukri snakes are found Thailand wide – and nearly all of them have the distinctive pattern on the top of the head as shown in the image above. Kukris are ground snakes which like cruising through and around the leaf litter. They eat eggs of all kinds, and small animals. While they are not venomous, they do have enlarged rear teeth which are shaped like kukri knives. They use these specialized teeth for cracking eggs so they can drink the inside yolk. ©2015 Bob Burgess. Used with permission. Name: Ptyas mucosus (Oriental rat snake). Previously known as Ptyas mucosa. Length: Up to 370 cm but usually under 3 meters. Range: Throughout Thailand, and common in Hua Hin area. 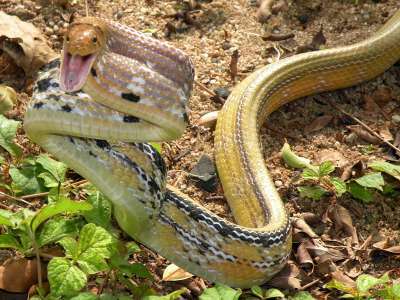 Habitat: The Oriental Rat snake prefers open forests, and at times comes into residential areas. I have had a number of ID requests for these snakes found in gardens. It is terrestrial, and arboreal, but spending most time on the ground. Active Time: These snakes are active during the day and at dawn. At night the snakes can be found sleeping in loose rolls on bushes and in the branches of trees. 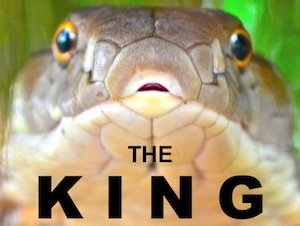 Description: Long, thick snake somewhat resembling and possibly mistaken for a king cobra. There are distinctive black lines on the lower jaw which are distinctive. 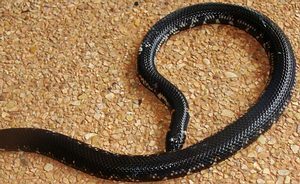 The snake is brown bodied, with light bands on the base of the neck and mid-body, turning to black bands toward the tail. 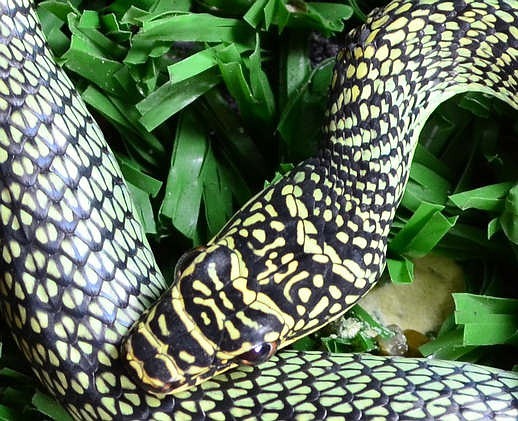 Food: An opportunistic feeder, P mucosa eats rodents, lizards, frogs, birds, and other small animals, The oriental rat snake has a triangle cross-section with a well-defined vertebral ridge which can indicate it may be a snake eater. While at the Queen Saovabha Snake Institute in Bangkok, Thailand I took a photo of this snake taking the head of Coelognathus radiata (radiated rat snake) into its mouth and then letting it go. If hungry, it is certainly big enough to eat a 2 meter long C radiata. Large snakes of this species do not have venom, nor do they constrict prey. They simply crush them with their body weight. This snake often eats prey while it is still alive. Defensive Behavior: This snake is not a big biter, despite its size and significant strength. Some bite, some don’t. Rat snakes have some flexibility in how they strike, and can do so from many different positions. They need not rear back to strike. Danger: Danger of a strong bite which may get infected. No venom or delivery system. Notes: Unfortunately we don’t get these in Krabi province. 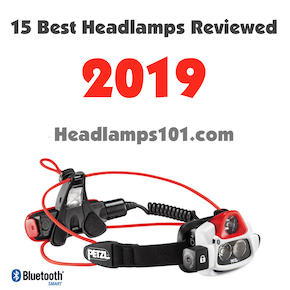 I’ve never seen one dead on the road, never seen one in the wild, and never fielded any ID request from someone locally who had shot a photo of one. Rupert Lewis from the United Kingdom was out herping in Thailand a couple nights ago and came upon this little beauty. It’s Gongylosoma baliodeirus or possibly a subspecies. I say possibly because I can’t find any information about the snake online at all. A Google search on image and text of the name of the snake produces nothing but the name, classification and who first found it (Boie). 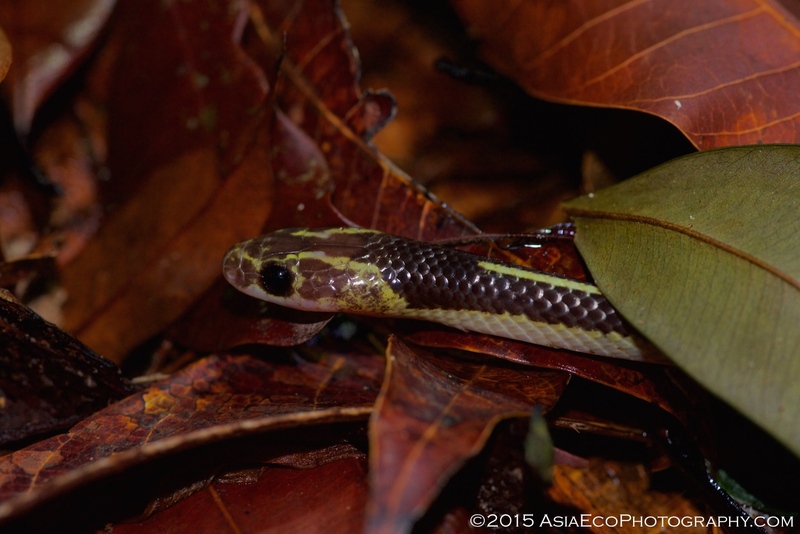 I did find one report of this snake being found in Borneo at 2,000 feet elevation on Mt. Penrissen, Sarawak, Malaysia. Rupert had an illustration he found in a book that identified it as Gongylosoma, but that’s about all we know from information found in books or online. 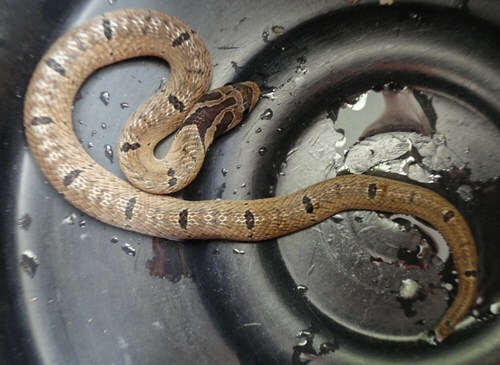 The snake was caught at night in Krabi Noi rainforest (Krabi province, Thailand) after midnight on a half-moon night. The elevation was roughly 100 meters above sea level. This snake is about 40 cm in length and under 5 cm in girth at its thickest. It is smooth-scaled and Rupert counted 8 diagonal scales to the vertebral column. The snake was cooperative and did not attempt to bite. 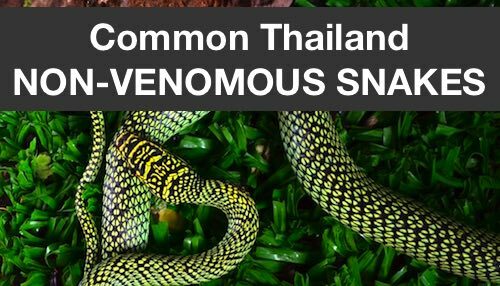 This is a new range for this snake, as previously they have not been found in Krabi province. They are rare in Thailand at all, and have only been found in some of the southernmost provinces. The photos are copyright 2013 Vern Lovic, with thanks to Rupert for sharing this snake with me. First published May 22, 2013. Updated Aug 15, 2015. Description: Fusca comes from the latin, fuscus, meaning dark or dusky. In adults, the body and head are brown. The head is long and distinct. The head resembles Ptyas korros quite a bit, unless they are side-by-side, I don’t think I could tell them apart by head shape. Eyes are large and pupils are round. There is occasionally a red stripe down the vertebral column. Some light banding can be seen laterally in some snakes. The tail can be black. There is a black lateral stripe that stands in contrast to the whitish of the venter, unlike other rat snakes. In juveniles of this species, the head, neck, and almost to mid-body can be a green tint. There can also be a noticeable pattern / banding that disappears with age. Range: This rat snake has been found in Peninsular Thailand in Nakhon Si Thammarat, Krabi, Trang, and Phang-Nga provinces. It is likely resident in many forests in Southern Thailand. Habitat: Found in primary and secondary evergreen forest and rubber plantations. Behavior: This snake is terrestrial and diurnal, sleeping at night on tree branches. When disturbed it raised up vertically and holds position, almost like a cobra. I have also seen this snake do this on the sides of roads to look up over the grass to see if the coast is clear to cross. Food: Primary prey is birds, rodents, and lizards.. 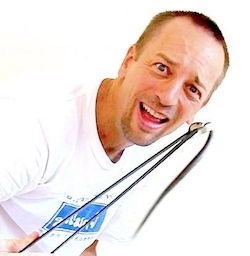 Defensive Behavior: Quick strikes, not necessarily from a coiled position or S-shape. After some handling, some of these snakes will calm down and cease striking. Venom Toxicity: No fangs to deliver venom. Danger: No danger from venom, but these are biting snakes that may inflict some lacerations / puncture wounds. 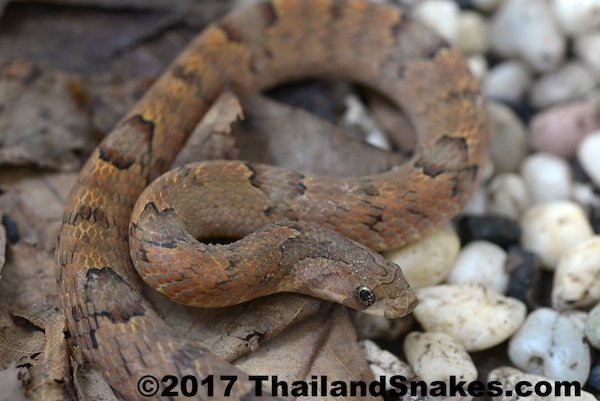 Notes: I have not caught this snake in Southern Thailand yet, but I have seen them occasionally on the side of the road. I have also handled one in captivity. They are quite different looking from the other rat snakes of the area. Description: This is a thin snake less than the thickness of a finger. It has a light yellow mask and comes in one of two color pattern variations. Shown here is the pattern with a brown background and longitudinal stripes running from neck to tail. There is one along the vertebral ridge and one on each side. The eyes of this snake are rather large compared to the very small head. The head is slightly smaller than the neck of the snake. There are two very small rear-fangs seen upon inspection of the mouth. The head of this snake is not elongated in a long triangle like the Lycodon family of snakes – which is one way to tell the difference. Range: Thailand’s southern provinces. 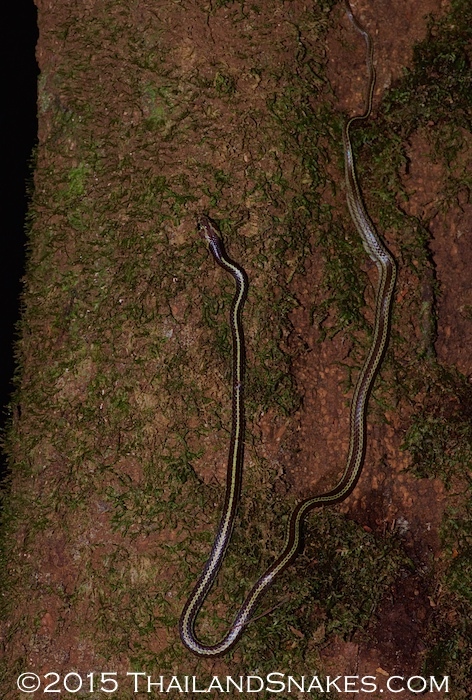 This snake was found in Krabi province at 450 meters elevation at 2200 hours two meters high on a thick tree covered with moss (see photo below). I have also found them at 200 meters elevation in evergreen forest and around 100 meters on a sloped rock face. Habitat: Bushes, trees, and dwellings. This snake is not as common as the Laotian Wolf Snake, but likes the same kind of habitat – but is usually climbing on something. It searches trees and structures for geckos primarily. They are excellent climbers and love vines and light brush. Food: Small geckos and frogs primarily. Defensive Behavior: I have yet to see this snake strike, even after handling a half-dozen of them. Usually they are very calm. Venom Toxicity: Weak or none. Ineffective for humans if there is any venom. The fangs are quite small – less than the diameter of a regular stick pin. Offspring: Nothing known about this area. Notes: These are great snakes for first time snake hobbyists to handle for a short time in the wild. If they are striking initially, they quickly calm down when held for a short time. There is a very real danger of mistaking these harmless snakes with a Malayan, Many Banded, or Banded krait – all of which are deadly. Kraits can get bigger than 1 meter. This snake, and the other harmless black and white banded snakes – will not get over 70 cm generally. 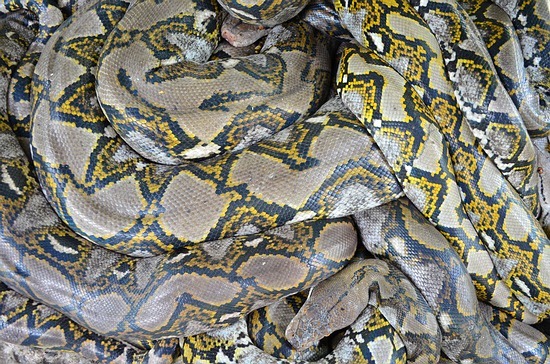 White or yellow bands on brown or black body is the typical pattern for this snake. Brahminy Blind Snake – non venomous, burrowing snake native to southeast asia. 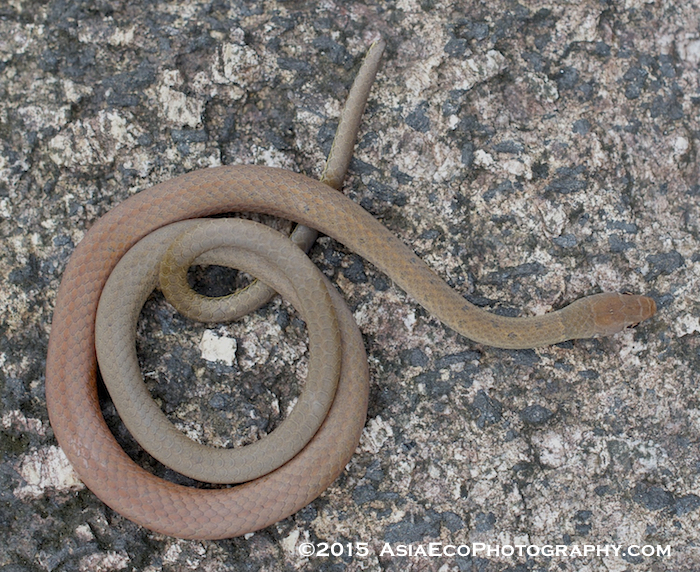 Brahminy Blind snakes are parthenogetic – can spawn young without males. VERY COMMON non-venomous snakes which are in nearly every country across the world. It is a myth that these snakes are venomous and deadly. Here in Thailand it is a pervasive myth. These snakes resemble thin black worms in Thailand. They have a lot of energy when you pick one up. You will likely find them in soil in your potted plants or climbing up through your drain in your restroom. 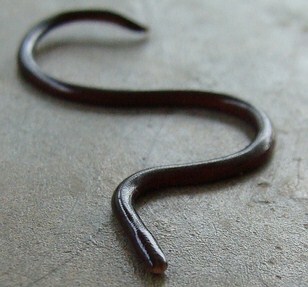 Brahminy Blind Snakes are completely harmless. Range: All over Thailand and much of the world, native to Southeast Asia. Transported across the world in potted plants. Notes: These are ground dwelling and burrowing snakes. They are shy. They are easily eaten by many other predators like birds, monitors, and other snakes. The Red Tailed Pipe snake eats these snakes often. The blind snakes have very small eyes covered with a thin skin that protects them as they burrow through the dirt. Many people have this tiny black snake come up through the pipes into their homes. We found dozens of them in our home, having come through the shower drain. They are completely harmless and yet there are rumors across the world that these are deadly snakes capable of killing humans with one bite. It is completely false. Do not kill these snakes, they are beneficial to the environment – they eat termite and ant eggs. Active Time? Anytime. I have found them at night and daylight – under leaves or other litter on damp ground, and of course crawling up through our drains. Food: Ant and termite eggs primarily. Defensive Behavior: Flip around craziliy and will attempt to flee. 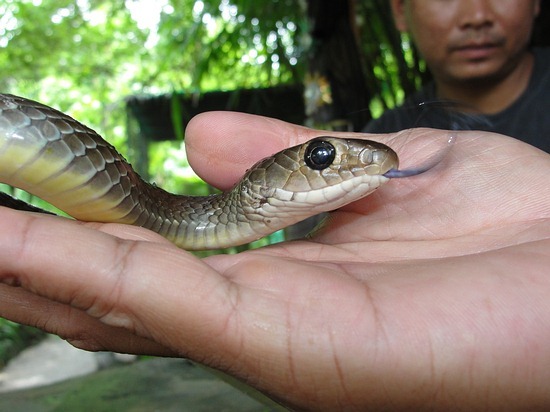 The mouth is too small to inflict a bite on humans, and I have never seen one of these small snakes attempt to bite. Venom Toxicity: No venom or means to inject it. Offspring: An interesting twist here. Brahminy Blind snakes are all born female and need no males to continue the species (parthenogenic). They are parthenogenetic. When they reach sexual maturity they lay fertile eggs – and hence, are fully self-perpetuating the species. If there is one – soon there will be more! These snakes have populated much of the western world and can be found in Thailand, India, Hawaii, Louisianna, Boston, and other places in the USA and across the globe now. A Non-venomous Red-tailed Pip Snake (Cylindrophis ruffus) found in Southern Thailand during one of our herping field trips to look for snakes. Red Tailed Pipe Snake – non venomous – small. 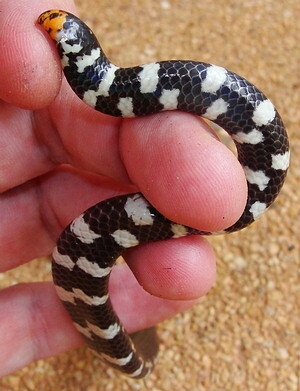 The white – black pattern of half stripes is the belly. The top is completely black in adults and has some banding on the lateral sides in either white or some shade of red. The red-tailed pipe snake is a beautiful snake, though at first glance you might wonder if it is a snake at all! It has a very flat appearance for the tail region, and very black on the top. The head is so small you might think it’s a large fat worm. The eyes are very small. This snake spends a lot of time in the dirt looking for grubs, maggots, and very small larvae and things. Range: All over Thailand on flat ground and at some elevation up to 1700 meters. Notes: I had one of these red-tailed pipe snakes at my home to photograph and shoot video of for two days. They are beautiful snakes. Their top is black and has a radiance like a sunbeam snake – you know that rainbow appearance when the sunlight hits it? Beautiful. Then, on the underside the bands of black and white don’t line up – so it’s very different. The bands will turn red and black as the juvenile red tailed pipe snake ages. The head is very small and the eyes – almost impossible to see. I’ve found these pipe snakes in the fine mesh of roots growing into the water of streams, and also in leaf litter on mud bordering streams. Around my home in Krabi Town I have found dozens dead on the road in the morning time – especially after rains. Habitat: The snake lives on the ground and in rat holes and termite mounds, under stumps or rocks and in other cool, damp places. Active Time? The snake is mostly nocturnal and is active at night. Food: Brahminy blind snakes, insect larvae, small frogs and worms. Defensive Behavior: This pipe snake hides the head under loops of it’s body and flips it’s red tail end up in the air – flattening it – as if like a cobra. 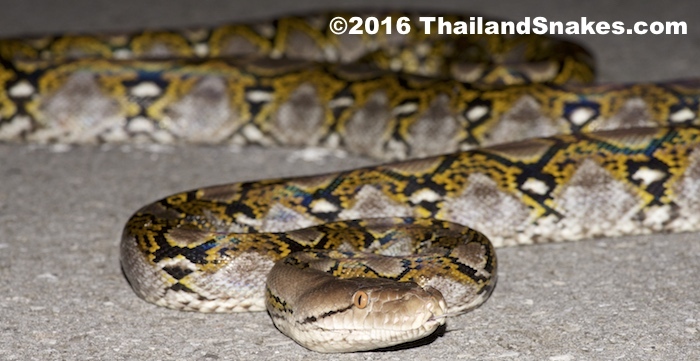 Thais call this the 2-head snake because it wants you to think it has two. In an hour of handling this snake, it made no move to bite at all. That doesn’t mean it won’t, but they are not all that inclined to bite. Their mouth is VERY small and they’d have to catch you just right to bite you. Venom Toxicity: None that affects humans. Offspring: This snake has 5-10 young, born live, about 20 cm long (about 8 inches). The top of this snake is completely black and patternless. The body is relatively flat shaped, and can be made very flat when it chooses.